To evaluate the impact of varying treatment time on the efficacy of iontophoresis-assisted transepithelial corneal cross-linking (I-CXL) in ex vivo porcine corneas. One hundred twelve porcine corneas with intact epithelium were divided into 7 groups and analyzed. Groups 1, 2, and 3 received standard epitheliumoff CXL (S-CXL) with hypo-osmolaric 0.1% riboflavin and 30 minutes of ultraviolet-A (UV-A) irradiation at 3 mW/cm2, 10 minutes at 9 mW/cm2, or were not irradiated (controls). Groups 4, 5, 6, and 7 received I-CXL for either 60 minutes at 1.5 mW/cm2, 30 minutes at 3 mW/cm2, 10 minutes at 9 mW/cm2, or were not irradiated (controls). Elastic modulus and stress after relaxation of 5-mm wide corneal strips were analyzed. In the S-CXL groups, significant differences (P ≤ .05) in stress-strain extensometry were found between controls and 3 mW/cm2 for 30 minutes (group 1) and between controls and 9 mW/cm2 for 10 minutes (group 2). In the I-CXL groups, only the 1.5 mW/cm2 for 60 minutes setting (group 4) showed a significant stiffening effect. All epithelium-off groups provided a stiffening effect significantly stronger than I-CXL: with a stiffening effect of 149% and 112%, groups 1 and 4 were the groups with greater elastic modulus between the S-CXL and I-CXL groups, respectively. The biomechanical effect of I-CXL increased significantly when using a low irradiance/long irradiation setting. Oxygen diffusion thus represents a limiting factor even when riboflavin penetration is improved via iontophoresis. Still less effective than S-CXL, this modification may help establish transepithelial CXL as a treatment option in selected cases. The objective of this study was to assess whether prolonging irradiation time, and thus tissue oxygenation, might improve the biomechanical outcome in I-CXL. One hundred twelve freshly enucleated porcine eyes were obtained from the local slaughterhouse (Zurich, Switzerland) and used within 12 hours. Eyes had not been steamed, showed an intact epithelium, and were divided in 7 different groups. We chose the porcine cornea as the model due to the large number of samples that were required for biomechanical testing. All enucleated eyes were from pigs aged 6 to 8 months. For standard epithelium-off CXL protocols (S-CXL), the corneas were completely deepithelialized using surgical blades, followed by soaking with 0.1% riboflavin for 30 minutes and UV-A light irradiation at 3 mW/cm2 for 30 minutes (group 1) or at 9 mW/cm2 for 10 minutes (group 2). Controls were deepithelialized and soaked with riboflavin, but were not irradiated with ultraviolet-A (UV-A) (group 3). In the experimental I-CXL groups, the corneal epithelium was kept intact. Riboflavin penetration through the cornea was performed using a commercially available iontophoresis device (I-ON CXL; Iacer, Veneto, Italy) and a sodium edetate and trometamol–enriched riboflavin phosphate 0.1% hypotonic solution (Ricrolin; Sooft, Montegiorgio, Italy). I-CXL protocols allow for a delivery of riboflavin in the corneal stroma through the assistance of an electric current, which leads to the reduction of soaking time.12,18 A 1.0-mA electric current was applied to the suction ring for 10 minutes (2 repeated cycles of 5 minutes), followed by irradiation with 1.5 mW/cm2 for 60 minutes (group 4), 3 mW/cm2 for 30 minutes (group 5), or 10 mW/cm2 for 9 minutes (group 6). Controls were subjected to iontophoresis with riboflavin but were not irradiated with UV-A (group 7). For all irradiated groups, an 11-mm spot diameter was used for UV-A irradiation (365 nm) of the cornea (CCL-Vario Crosslinking; Peschke Meditrade GmbH, Zurich, Switzerland). The total energy was 5.4 J/cm2 for all groups. Frequency of riboflavin application was similar in all groups throughout the entire procedure: corneas were instilled with riboflavin during the soaking period every 3 minutes and during UV-A irradiation every 5 minutes. All eyes had their biomechanical analysis performed after a similar time of withdrawal from the refrigerator. In addition, in the 5 minutes preceding the biomechanical measurement, all corneas remained on balanced saline solution to standardize the hydration of all the samples. Details were summarized in Table 1. All corneas were analyzed using stress-strain extensiometry as described previously.15,19 After removal of the corneoscleral button from the globe, two corneoscleral strips (5-mm width, full thickness) were prepared centrally in the horizontal axis from each eye. Four millimeters of the end of each strip were dedicated to fixation, leaving approximately 11 mm of central corneal strip length. Tensile strength measurement was performed using a stress-strain extensometer (Z0.5; Zwick GmbH & Co., Ulm, Germany), calibrated with a distance accuracy of 2 mm and a tensile sensor with no more than 0.21% of measurement uncertainty between 0.25 and 50 N. The Z0.5 is a classic extensometer composed of a linear holder extension arm whose speed can be controlled and a Newton meter, which measures the real-time force in Newton exerted by the arm on the held specimen. The conversion from force to stress was calculated from the thickness and width of the specimen. The arm speed was 2 mm per minute in the conditioning cycles and the position was controlled at the point of load application during the test phase. The biomechanical characterization included elastic and viscoelastic testing up to a force of 2 N.
For the current analysis, we considered both the stress strain and the stress relaxation curve. 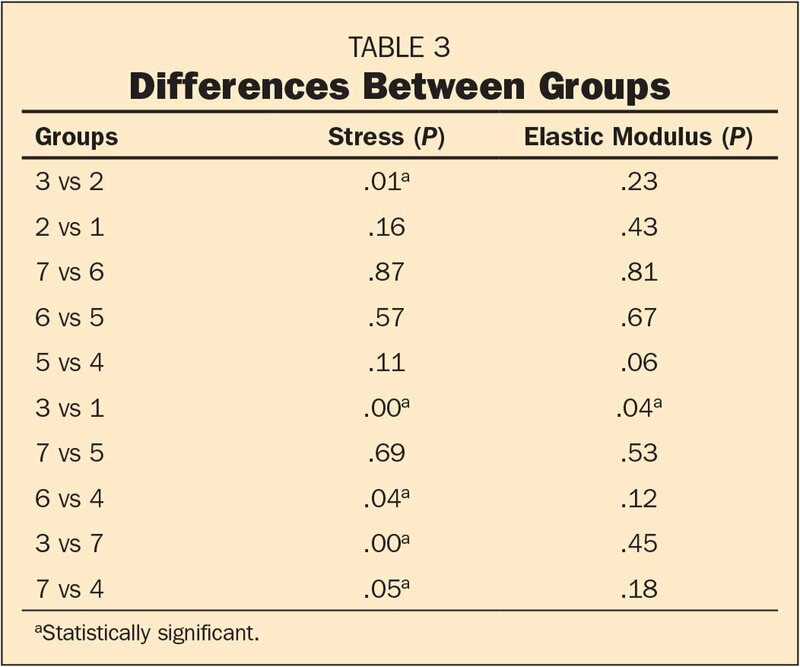 Based on elastic modulus, the stiffening effect was calculated in each of the groups with respect to their own control group. The slope of the stress-strain curve corresponds to the tangent elastic modulus (Young's modulus) and was determined between 1.5% and 4.5% of strain. This range was selected because it showed a linear relation in the stress-strain diagram. Data analysis was performed using the Xpert II-Testing Software (Zwick GmbH & Co.). Statistical analysis was performed using SPSS statistical software (version 24; IBM Corporation, Zurich, Switzerland) and the Microsoft Excel program (Excel 11 for Mac; Microsoft Corporation, Redmond, WA). Normal distribution was confirmed with both the Shapiro–Wilk and Kolmogorov–Smirnov tests. In the case of normal distribution and analysis of variance (ANOVA) test with statistical significance, the LSD post-hoc test to multiple comparisons was used to determine significant differences between groups. In the case of non-normal distributions, the non-parametric Kruskal–Wallis test was used to verify statistical significance before the final analysis by the Mann–Whitney test. For both the ANOVA and the Kruskal–Wallis tests, the confidence interval of 95% was used to determine significant differences between groups. Statistical significance was considered significant whenever the P value was .05 or less. Both the ANOVA analysis and the Kruskal–Wallis test showed significant differences for stress (P < .001) and elastic modulus (P < .001), respectively. Table 2 shows the mean values with standard deviations and Table 3 shows the P values found between each condition tested. In the groups submitted to standard epi-off CXL, differences were found between controls (group 3) and 3 mW/cm2 for 30 minutes (group 1) and between controls and 9 mW/cm2 for 10 minutes (group 2). No difference was found between groups 1 and 2. Among the I-CXL groups, stress differences at the end of the relaxation curve were observed between 1.5 mW/cm2 for 60 minutes (group 4) and 9 mW/cm2 for 10 minutes (group 6) and between 1.5 mW/cm2 for 60 minutes (group 4) and their controls (group 7). Among all, group 4 reached the highest stress after relaxation. Elastic modulus at the range of 1.5% and 4.5% of strain showed significant differences between 3 mW/cm2 for 30 minutes (group 1) and its control group (group 3). Group 1 also had the highest elastic modulus, with a stiffening effect of 149%. 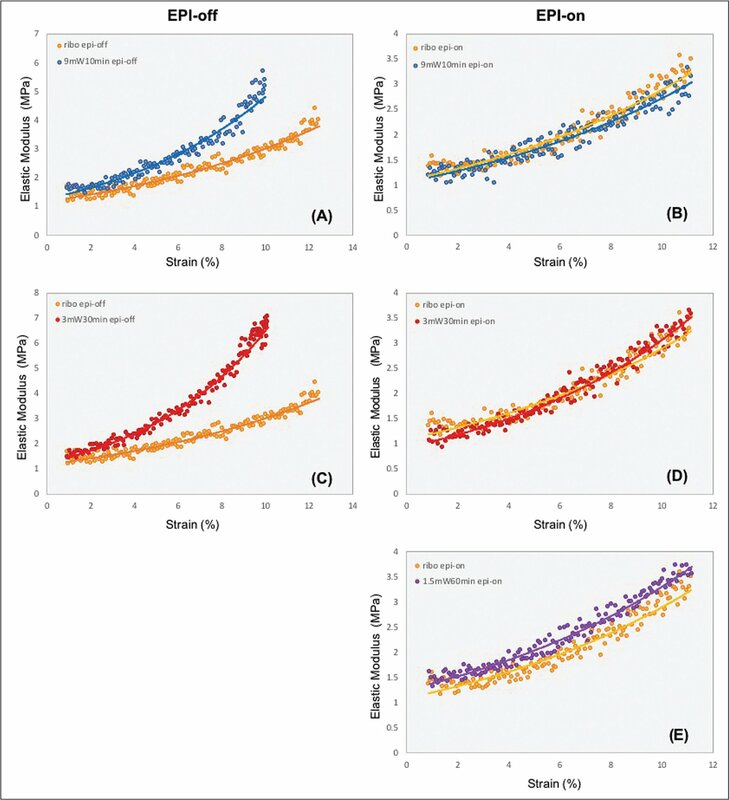 The stiffening effect of each specific group is shown in Table 1, whereas Figure 1 shows the median of the elastic modulus as a function of strain in all groups. Median of elastic modulus as a function of strain in all groups. Left images compare standard epithelium-off corneal cross-linking protocols (S-CXL) with their control: Figures A (groups 2 vs 3) and C (groups 1 vs 3). Right images compare the experimental iontophoresis-assisted corneal cross-linking groups (I-CXL) with their control: Figures B (groups 6 vs 7), D (groups 5 vs 7), and E (groups 4 vs 7). The observation of all corneas of the I-CXL groups did not show epithelial disruption macroscopically, either after the soaking phase of riboflavin or after UV-A irradiation. Our results suggest that I-CXL with a de-accelerated prolonged irradiation of 1.5 mW/cm2 for 60 minutes resulted in an increased biomechanical stiffening when compared to the other I-CXL protocols. Nevertheless, this improved stiffening effect in I-CXL remained inferior to any of the epi-off S-CXL treated groups. Reported advantages provided by I-CXL include less pain and faster recovery, but clinical studies using I-CXL have shown that it is less effective in stabilizing keratoconus progression,13,20,21 which is consistent with our findings. Although faster treatments are desired, our ex vivo data suggest that the biomechanical effect of I-CXL increases significantly when deaccelerating the standard protocol, using even lower irradiance levels and longer irradiation time settings (group 4), doubling the time of the classic standard protocol from 30 to 60 minutes. It may be worth mentioning that such an increase in stiffening effect might therefore be better biologically but potentially less useful for clinic flow and utility. Tensile strength measurements of the I-CXL groups could not demonstrate a significant increase in corneal stiffening when using lower irradiances of 3 mW/cm2 for 30 minutes (group 5) or 9 mW/cm2 for 10 minutes (group 6). In an experimental model with rabbits, a subgroup of 8 eyes treated by I-CXL with accelerated irradiation of 10 mW/cm2 for 9 minutes was compared with the same number of eyes treated by S-CXL and standard protocol and with 10 untreated control eyes.34 In this study, Cassagne et al.34 found comparable results of stress at 10% strain and resistance against corneal collagenase between I-CXL and S-CXL groups. However, the comparison of groups was done directly between both groups (ie, without a specific control group for each I-CXL and S-CXL). From our standpoint, such a direct comparison may have been a bias in the analysis. Furthermore, in a different subgroup of eyes from the same study, the authors observed 45% less riboflavin concentration in corneas soaked by iontophoresis than by standard epi-off application. In the current study, we could show that a difference in stromal riboflavin concentration also leads to a difference in the biomechanical response. This observation reinforces the importance of different control groups for both S-CXL and I-CXL. A recent morphological and histochemical report showed changes in the organization of collagen fibers in healthy and keratoconic corneas following accelerated S-CXL and I-CXL. Although such an approach cannot quantify corneal stiffness, some corneal structural differences were noticeable with the I-CXL protocol. Still, the arrangement and interweaving of fibers were much more similar to healthy corneas when using the S-CXL protocol.35 These findings are in agreement with ours, and place I-CXL as a potential alternative treatment in selected cases. This study has some limitations. As an ex vivo study, our extensiometry findings may not be fully equivalent to the biomechanical response in vivo. However, the methodology employed is widely established. Moreover, a potential source of error for such studies is related to alteration of corneal hydration and thickness. Corneal thickness was not documented before and after soaking with riboflavin in our study, but all corneas were exposed to riboflavin in a similar and standardized manner. An additional limitation is that no direct measure of oxygen concentration in the corneal stroma was performed. Although desirable, implanting an optical fiber from an oxygen meter into the cornea would affect the corneal biomechanical evaluation. A further limitation concerns the sensitivity of the method. It is possible that subtle cellular and tissue alterations could be detected with a more sensitive biomechanical measurement technique. The recent introduction of Brillouin microscopy may further elucidate these mechanisms.36 To date, it is not known how much increase in corneal stiffness is needed to arrest the progression of corneal ectasias. Therefore, prospective in vivo studies are necessary to confirm the clinical validity of our findings, in both the short and long term. The biomechanical effect of I-CXL increased significantly only when using a low irradiance and long irradiation time setting. In addition to the barrier effect on diffusion, the epithelium has a high rate of oxygen consumption, further restricting stromal oxygen availability in the I-CXL protocols. Even when the issue of riboflavin penetration is partially addressed in I-CXL, oxygen diffusion may remain as a limiting factor. To increase I-CXL efficiency, longer irradiation times (which are even slower than the standard protocol) might be needed. Still less effective than S-CXL, this modification might be useful in clinics when the risk for postoperative infection due to eye rubbing is judged higher than the reduced efficacy of the cross-links. Torres Netto EA, Al-Otaibi WM, Hafezi NL, et al. Prevalence of keratoconus in paediatric patients in Riyadh, Saudi Arabia [published online ahead of print January 3, 2018]. Br J Ophthalmol. doi:10.1136/bjophthalmol-2017-311391 [CrossRef]. From the Ocular Cell Biology Group, Center for Applied Biotechnology and Molecular Medicine, University of Zurich, Switzerland (EAT-N, SK, FH); ELZA Institute, Dietikon, Switzerland (EAT-N, SK, NH, FH); Paulista School of Medicine, Federal University of São Paulo, São Paulo, Brazil (EAT-N); Istituto Clinico Humanitas, Milan, Italy (PV); USC Roski Eye Institute, University of Southern California, Los Angeles, California (JBR, FH); Faculty of Medicine, University of Geneva, Geneva, Switzerland (FH); and the Department of Ophthalmology, University of Wenzhou, Wenzhou, China (FH). Supported in part by an unrestricted departmental grant from Research to Prevent Blindness, Inc., to the USC Roski Eye Institute, Los Angeles, CA (JBR), the Light for Sight Foundation, Zurich, Switzerland (FH), Velux Stiftung, Zurich, Switzerland (FH), and the International Council of Ophthalmology Award (EAT-N).